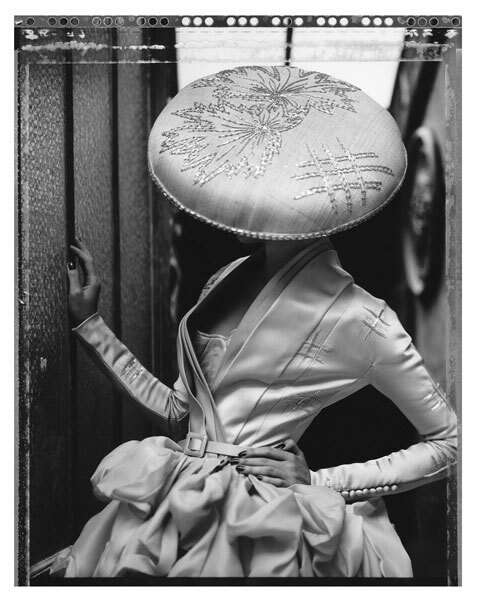 Edwynn Houk Gallery announced the first exhibition of Cathleen Naundorf’s photographs to be presented in New York. On view from January 14th – February 27th, the gallery will display a selection of works from several of the artist’s series including Un rêve de mode and L’Arche de Noé. Drawing from a range of influences, including her background in painting, travel photojournalism, and fashion photography, in addition to her longstanding mentorship with photographer Horst P. Horst, Naundorf photographs one of a kind couture fashions positioned within rich otherworldly scenes that the artist carefully constructs. Naundorf works primarily in large format polaroid film, a tool which demonstrates her connection to the fashion world; however, she does not use the film as a quick study tool, but instead embraces the saturated color and unique textures of the medium for her finished works. Using her own unique development process, Naundorf manipulates the inherent textures and color variations found in each photograph to further enhance the painterly atmosphere and surface quality of her prints. Cathleen Naundorf was born in Weisenfels, Germany in 1968. In the early 1990’s, she began working as a photojournalist and photographed various ethnic groups around the world including the Yanomami in Amazonia, the Mongols and Kazakhstanis in the Altai Mountains, and the shamans in Yakutia, Sibiria. Inspired by her friendship with Horst P. Horst, Cathleen Naundorf also became interested in fashion photography early in her career. In 1997 she began photographing backstage at Paris fashion shows for Condé Nast, and in 2000 she began working with her trademark polaroid and large format cameras. From 2005 to 2011, Naundorf undertook the epic series Un rêve de mode for which the artist gained unprecedented access to the couturiers’ archives of fashion houses such as Chanel, Dior, Gaultier, Valentino, Saab, Lacroix and Philip Treacy in order to create her elaborate and cinematic images. In 2012 Prestel published the series in the limited edition monograph, Haute Couture: The Polaroids of Cathleen Naundorf. Since 2011, Naundorf has worked privately with Mr. Valentino Garavani on several projects including An Italian Story and the photo-documentation of Mr. Garavani’s collaboration with the New York City Ballet, and her work is consistently featured on the pages of Harper’s Bazaar and Condé Nast publications. The artist lives and works in London and Paris. Category: Lifestyle Tag: art, fashion.